America's Advanced Industries produce 17% of the national gross domestic product and serve an important role in the country's economy. Yet this sector is under pressure from eroding competitiveness and national economic drift. Explore this proposal to consider a comprehensive solution to this problem. Experts from The Brookings Institution have published this proposal. As these organizations do not take institutional positions, this proposal reflects the views of the individual authors. Tseren recently graduated from Hofstra University with a dual-major in Economics and Philosophy and a minor in Philosophy of Law. 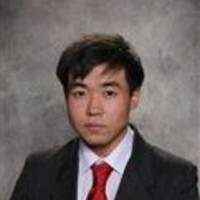 He was born in Kalmykia, Russia and raised in New Jersey and is passionate about public policy. Many nations are increasing their investments in research and development (R&D), STEM workers, and strong regional technology ecosystems just as the US commitment weakens. As a result, recent decades have seen large-scale losses of manufacturing jobs, a growing trade deficit even in advanced technology products, and other economic problems. 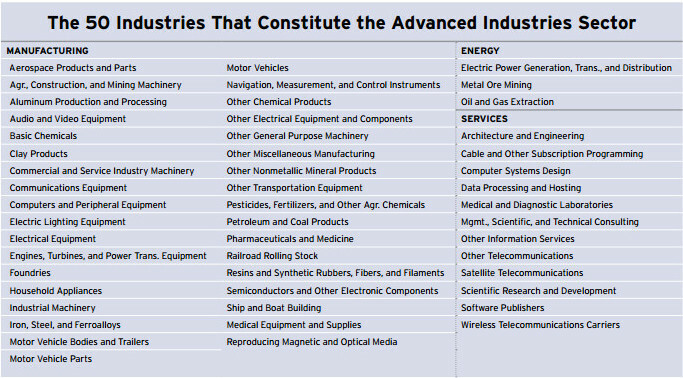 The advanced industries are characterized by their deep investments in R&D (exceeding $450 per worker) and their large share of STEM workers (over 21% of an advanced industry's workforce can be found in occupations requiring a high-degree of STEM knowledge as defined). These industries encompass the nation’s “tech” sector at its broadest and most consequential. The advanced industry sector is the nation’s top source of the innovation that drives increased productivity, which in turn generates increased profits and market share for firms, growth for industries, and broad economic benefits for households, regions, and the nation. 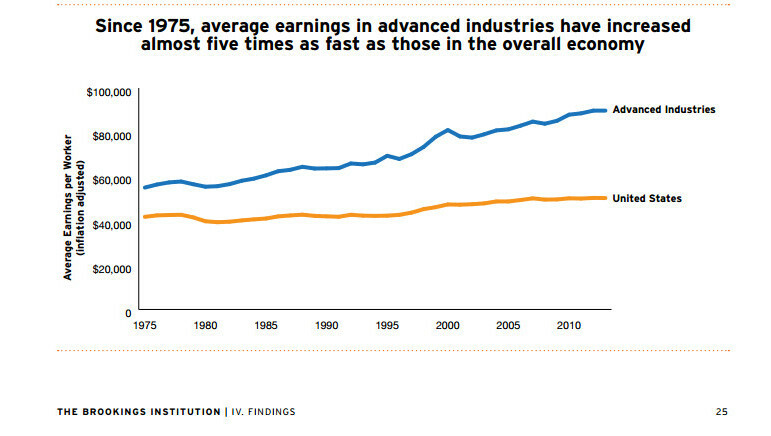 As of 2013, the advanced industries employed 9% of all US workers and comprised 17% of the country's GDP, more than any other sector, including healthcare, finance, or real estate. The advanced industries employ 80% of the nation’s engineers; perform 90% of private-sector R&D; generate approximately 85% of all U.S. patents; and account for 60% of U.S. exports. Advanced industries also support unusually extensive supply chains and other forms of ancillary economic activity. On a per worker basis, advanced industries purchase $236,000 in goods and services from other businesses annually, compared with $67,000 in purchasing by other industries. This spending sustains and creates more jobs. In fact, 2.2 jobs are created domestically for every new advanced industry job—0.8 locally and 1.4 outside of the region. This means that in addition to the 12.3 million workers employed by advanced industries, another 27.1 million U.S. workers owe their jobs to economic activity supported by advanced industries. The sector supports almost 25% of all U.S. jobs directly and indirectly. The US is losing ground on 2 important measures of advanced industry competitiveness: the size of the sector by employment and its output as a share of the total US economy. These measures show our economy pivoting away from advanced industry pursuits more sharply than competitor nations. 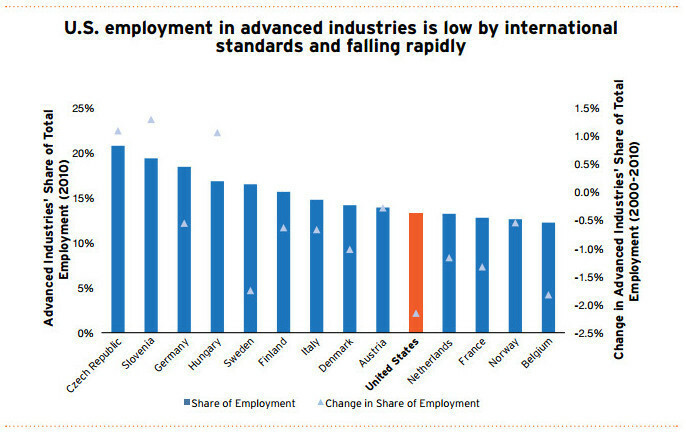 The US saw the share of its jobs in advanced industries decline from 2000 to 2010 by more than any of the other 14 countries with comparable employment and production data in 2010, the most recent year available from the OECD. 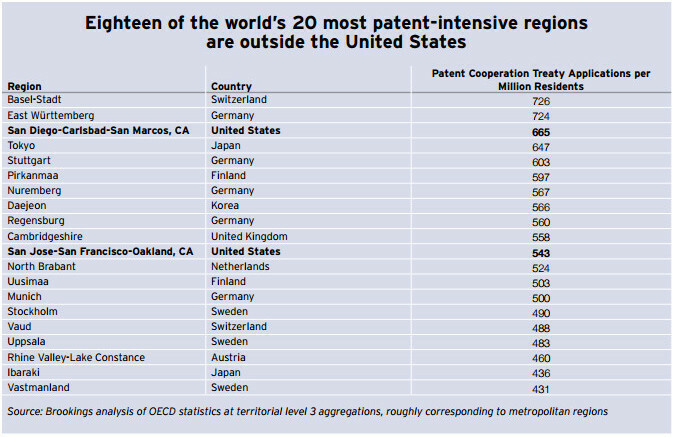 By 2010, 9 of the 14 countries were more specialized in advanced industries than the United States. This gradual erosion of US competitiveness is playing out starkly in terms of global trade, where advanced industries are crucial. 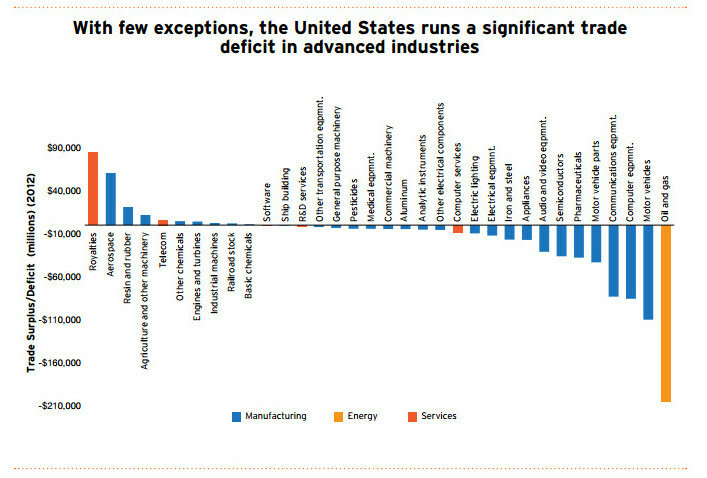 The US ran a $632 billion trade deficit in advanced industries in 2012. The US imports roughly $1.6 trillion in advanced industry products but exports just $0.9 trillion. Advanced industry trade deficits pose a serious threat to the country’s long-term prosperity. Because most innovation builds on existing technologies and is evolutionary in nature, the concentration of advanced industrial activity and know-how outside of the US puts the nation’s ability to own the next-generation of critical technologies into question. Reducing the trade deficit in advanced industries is essential to slow the erosion of US innovative capacity. Advanced industries are the focal point of innovative activities such as R&D and patenting, but the US advantage on these fronts is also slipping. 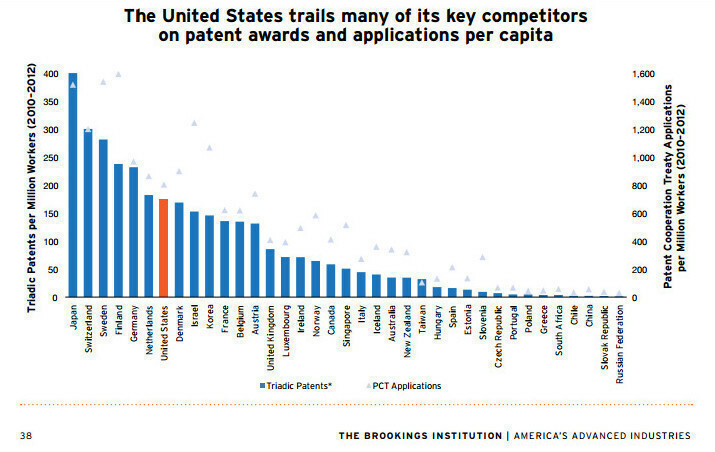 From 1981 to 2011, the US' share of global patenting and R&D spending declined by 12%. Advanced industries are the prime site of US innovation, but their global dominance is undercut by the nation’s slippage on crucial metrics of innovative capacity and output. Many advanced industry employers report difficulties finding qualified workers, which places a drag on advanced industry competitiveness. A key factor in these difficulties appears to be the sector’s heavy reliance on relatively scarce STEM skills. 60% of all job postings in advanced industries are for STEM workers, compared with 34% outside of advanced industries. Many advanced industry companies are having difficulty finding workers with the needed STEM skills, a problem that undercuts US competitiveness as a location for advanced industry production. At the problem’s core lies the fact that the our education system does not graduate enough college students in STEM fields, nor does it adequately prepare children to attain fluency in mathematical and scientific concepts. US youths and adults alike perform much more poorly on OECD exams of math and science competencies than many of their peers in developed countries. Even students in the top 10% of U.S. performers score well below their highest-scoring peers in other developed countries. This poor academic performance in middle school and adulthood corresponds with low STEM graduation rates at the postsecondary level. Measured in 2 ways—annual STEM graduates per capita and the share of total graduates completing degrees in STEM fields—the United States lags far behind other developed countries. 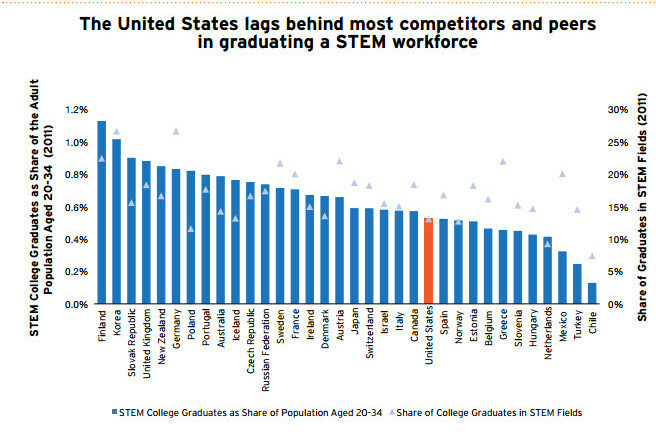 In terms of annual STEM graduates per person aged 20 to 34, the United States ranks 23rd among developed nations. Finland, Korea, the Slovak Republic, the United Kingdom, New Zealand, Germany, Portugal, and Poland—graduate STEM students at a rate at least 50% higher than the US. Similarly, our country ranks a distant 32nd in terms of the percentage of its graduates majoring in STEM fields, with just 13% of graduates choosing majors in science, computer science, or engineering. In Korea and Germany, 27% of college graduates choose these fields, and in countries as diverse as Greece, Mexico, and France, at least 20% of all graduates leave university with a STEM degree. Increasingly, the United States lacks the skills base to sustain advanced industry competitiveness. R&D spending: approximates the resources marshalled in the pursuit of new products, processes, and technologies. STEM: STEM knowledge categories include science (a composite measure that includes biology, chemistry, and physics), math, computer science, and engineering (a composite measure that includes engineering, mechanical, and design knowledge). This report asserts the special importance of the “advanced industries” sector to America's future. Robert D. Atkinson examines the issue of corporate tax reform and lays out key principles for policymakers to consider as well as specific policy recommendations for crafting an innovation-based corporate tax code. A comprehensive policy program to make the U.S. economy flourish again by invigorating enterprises through greater innovation, productivity, and competitiveness. This paper consists of an analysis of the major areas of production of U.S. exports. The findings resulting from this analysis lead the authors to draft policy ideas for federal and state governments as well as metropolitan leaders in innovation to improve America's competitive standing in exports. This series of policy profiles presents the main trends in national science, technology and innovation (STI) policies in support to STI actors. It discusses the rationale for public policy intervention, major aspects of STI policies and STI policy instruments, and recent policy developments across countries. 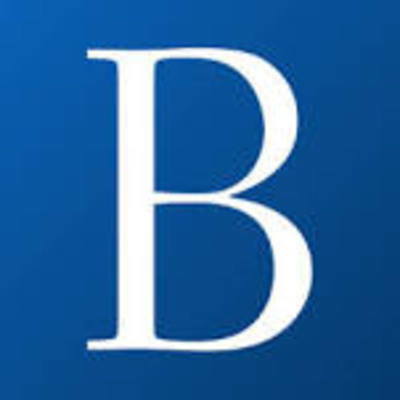 The Brookings Institution is a 501(c)3 public policy organization based in Washington, DC. Their mission is to conduct high-quality, independent research and, based on that research, to provide innovative, practical recommendations that advance three broad goals: (1) Strengthen American democracy, (2) foster the economic and social welfare, security and opportunity of all Americans, and (3) secure a more open, safe, prosperous and cooperative international system. The government should recommit to doubling its investment in basic R&D. The nation’s research pledge should also extend to applied R&D. The government also must update how federal R&D is conducted if it is to accelerate the domestic commercialization of innovation. Specifically, the government must embrace and scale up new collaborative formats for delivering public-sector R&D in ways that place federal investments closer to the marketplace, recognize the growing complexity of the innovation system, and improve the chances for commercialization at home. The government should invest in expanding a robust new model of collaborative, use-oriented research aimed at accelerating new product development in the advanced industries sector. Tax policies such as a collaborative R&D tax credit would reward joint university–firm investments. The federal government could allocate a portion of such funding to technology transfer—getting new technologies out of the lab and into firms. The federal government should leverage its modest P-12 funding role to improve accountability and encourage innovation in education, particularly in schools that serve lower-income students. The government should increase investment in applied STEM education at all levels. Federal investments play a significant role in strengthening the workforce pipeline. 14 federal agencies, including the National Science Foundation, the National Institutes of Health, and the Department of Education, spend more than $4 billion annually on graduate-level research grants and undergraduate fellowships. In addition, many of these agencies fund professional development for STEM educators and STEM education programs from preschool through high school. Given the importance of STEM to national economic competitiveness, the federal government should maintain if not increase its level of support for such activities. At the same time, the federal government should shift the focus of its STEM investments. Currently, the bulk of federal STEM education spending supports bachelor’s degree programs in science fields, with the goal of developing research professionals. Although worthy, that focus means that relatively little funding flows to community colleges, for example, or middle-skilled training. As a result, the nation may be missing out on low-cost opportunities to enhance the skills and earning power of a large segment of the American workforce. A variety of federal agencies have developed a smart set of programs for strengthening regional advanced industry ecosystems. The logic of linking federal hubs to regional clusters should also prompt Washington to reimagine federal assets in regions as ecosystem anchors and free them to engage in local economic development. Federal agencies should open their regional hubs to local exchanges. A. Significantly Expand the Research and Development Tax Credit. Increasing the rate of the Alternative Simplified Credit (ASC) will make the R&D credit more effective. The credit can also drive new innovation if Congress broadens the current credit for collaborative energy-related research to any area of research and expands the rate from 20% to 40%. By broadening the definition of qualifying R&D expenditures to include not just product R&D, but also process R&D, Congress could help manufacturers in particular become more competitive. B. Allow Companies to Expense in the First Year Expenditures on Capital Equipment. Currently companies must depreciate investments in capital equipment over a number of years. Allowing 1st year expensing would result in more investment in capital equipment while at the same time improving overall US tax competitiveness. C. Allow Expenditures on Employee Training to Qualify for the Alternative Simplified R&D Credit. Making workforce training investments eligible for a tax credit would spur firms to invest more in the training of their US workforces, enabling them to be more competitive and productive. Making these changes would not only make the US corporate tax code more competitive with other nations, leading to more higher wage jobs in the United States, it would also spur firms to invest more in the building blocks of growth: research and development, new capital equipment, and workforce training. The US should seek true market openings and regulatory harmonizations that reduce both tariff and nontariff barriers that advanced industry exporters face in foreign markets. Countries that engage in unfair trade practices should be held accountable. A fair market exchange rate of the dollar with the main US trading partners’ currencies could contribute to the expansion of US exports. US government should push for better access to more sectors especially in export markets that are growing rapidly. US should advocate appropriate changes to international trade law to address exchange rates. More bilateral trade agreements and especially multilateral trade agreements will deliver new foreign demand for US goods and services. The federal government should enhance the nascent regional innovation cluster initiatives. Federal export financing should be more targeted, to get more efficiency out of federal funding, reducing their costs upstream. The federal agencies involved in NEI should have a clear coordination process, with transparent distribution of funding and responsibilities for export promotion. The federal government needs to become more federalist in thinking and action and engage more aggressively with the private sector in the export strategy. Incorporate states and metropolitan leaders into the President’s Export Council. NEI should be an interactive and educational forum for all the actors involved, be it government or private sector. Collect better data on markets and export promotion activities. Policymakers should consider how to ensure access to “patient capital”—capital that recognizes the time needed for young and small advanced industry firms to take innovative new products into large-scale production. The Federal government should engage with private and civic sectors to ensure the swift movement of people, goods, services, water, and energy along reliable national and globally connected infrastructure networks. Policy changes on a federal level will need to be matched by initiatives from the state governments and the private sector. Innovation is the fundamental driver of economic growth, and advanced industries represent the very core of the nation’s innovation enterprise. Advanced industries support opportunity in other sectors, and have led the post-recession employment recovery. A stronger advanced industries sector means stronger and more broader economic prosperity in America. The Advanced Industries are the primary site of the R&D spending that drives product and process innovation in the economy. The sector is the nation’s top source of the innovation that drives increased productivity, which in turn generates increased profits and market share for firms, growth for industries, and broad economic benefits for households, regions, and the nation. As these policies make the Advanced Industries stronger and more competitive, we can expect to see more innovation. Stronger funding into K-12 and secondary education will produce a larger abundance of STEM knowledge while a recharged skills pipeline will result in more skilled and experienced STEM workers in the economy. The Advanced Industries sector also factors significantly in building and maintaining the nation’s skilled workforce. A storehouse of the nation’s STEM knowledge base, the sector also serves as a critical repository of skilled workers that over time flow out into the rest of the economy. The Proposal Revitalize America's Advanced Industries needs your vote by Invalid date.